The Time is the first album by The Time. 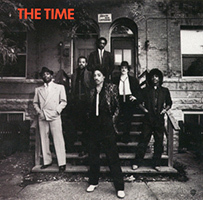 No songwriting credits are given on the album, but the album was largely written, recorded and produced by Prince (although production was credited to Morris Day and Jamie Starr), and contained little input from band members other than Morris Day, who provided lead vocals on all songs. Only one track, After Hi School, did not contain writing input by Prince, although he is believed to have performed all the instruments on the track. The album marked the first time Prince was involved in a full album other than his own. Recording took place in Prince's Kiowa Trail Home Studio, Chanhassen, MN, USA during April 1981, although Oh, Baby had originally been recorded during the Prince album sessions from late April to 13 June 1979, at Alpha Studios, Burbank, CA, USA (the version on the album is from the April 1981, sessions). The credits list the recording studio as the fictional "Time Studio", however. The album was mixed at Hollywood Sound Recorders, Los Angeles, CA, USA, in late April 1981. The album produced three singles, Get It Up, Cool and Girl, and the album reached number 50 on the US Billboard Pop Chart, and number 7 on the Billboard Soul LP's Chart. All songs written by Prince (uncredited), except where noted. This page was last modified on 4 September 2018, at 10:08.